A peaceful, wooded site overlooking the Strait of Juan de Fuca echoes the joyous calls of beachcombers and picnickers. 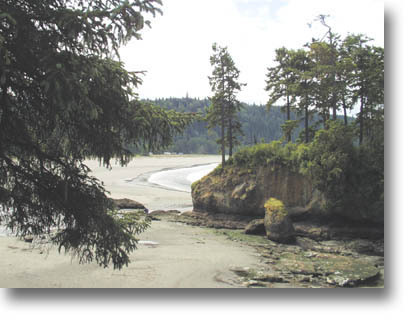 It is the Salt Creek Recreation Area, one of Clallam County's most popular parks. Less than 50 years ago, as Camp Hayden, the park site echoed the rumble of heavy construction and the rattle of trucks loaded with soldiers. The United States was beefing up its coastal defenses as World War II's clouds loomed ever darker. Named for General John L. Hayden, former commanding officer of Puget Sound harbor defenses, the 518-acre Camp Hayden military reservation at Tongue Point was part of the modernization of those harbor defenses begun in 1940 with anti-motor torpedo boats, seacoast armament and anti-aircraft installations. 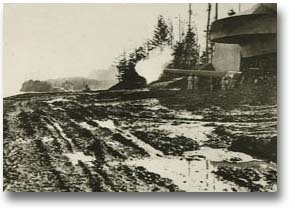 To keep up coastal defenses during construction of Camp Hayden at Tongue Point on Crescent Bay west of Port Angeles and of Fort Eby on Whidbey Island, existing seacoast batteries were maintained at Forts Flagler, Casey and Worden. 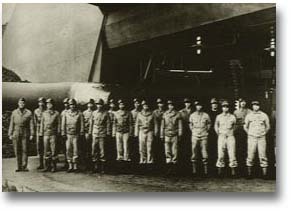 In 1941, batteries were installed near Port Angeles and at Angeles Point, later to be replaced by the guns of Camp Hayden. Before war's end, the Camp Hayden military reservation concealed two heavily camouflaged, bomb-proofed two-gun batteries: one six-inch installation 2,000 feet up Striped Peak and a 16-inch battery on Tongue Point. The guns were test-fired only once. The Camp Hayden batteries covered the entrance to Puget Sound, the Victoria, British Columbia harbor, and the Canadian naval base at Esquimalt. Housed in steel-shielded, canopied concrete bunkers designed to take a direct hit, the monster guns were 45 feet long, five feet thick at the breech, tapering to 16 inches in diameter at the point overlooking the Strait of Juan de Fuca. 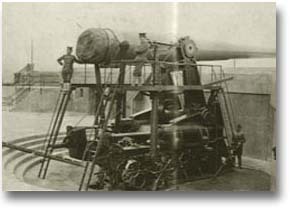 The turntable on which the gun and loading mechanism revolved was large enough to turn a small locomotive. Top-grade laminated steel barrels fired one-ton projectiles nearly 50,000 yards (approximately 28 miles). Three Worthington diesels supplied power that allowed soldiers operating the guns to revolve the turntables with a flick of the wrist. The diesels also fed the Camp Hayden power plant, which was buried under an embankment between the two guns. The plant included air conditioning and heating systems, which kept projectiles at consistent temperature and humidity. The Army built a road from the east into the Crescent Bay site and barracks along Salt Creek to house 150 soldiers. While on duty, the gun crews slept on cots in the tunnel linking the two emplacements. Mess hall and kitchen were also underground. The missile age made the mammoth precision-tooled instruments of destruction obsolete as soon as construction was completed. As the war ended, soldiers departed and the wharf, built on the west side of the bay was torn out. Owens Brothers, which got the contract to scrap the guns, used electric torches and dynamite to reduce each 16-inch monster to 500 tons of scrap, worth $30 a ton. The guns had cost the taxpayers several million dollars apiece. For more information, call the Clallam County Parks, Fair, and Facilities Department at 360-417-2291.